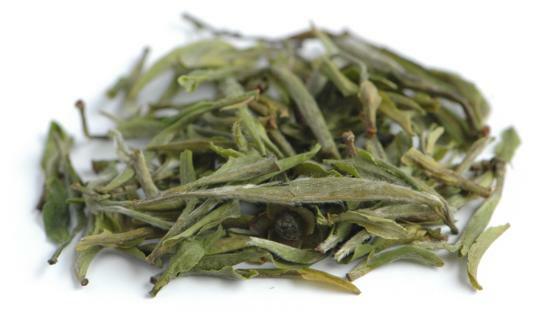 Huangshan Maofeng is a Chinese green tea whose leaves was picked in early spring, that is only about a month ago. And already has this golden beverage found its way into my teacup here in Sweden, waiting for a review – a positive one I might add. The beautiful Chinese name Huangshan Maofeng means “Hairy Peak of the Yellow Mountain”. 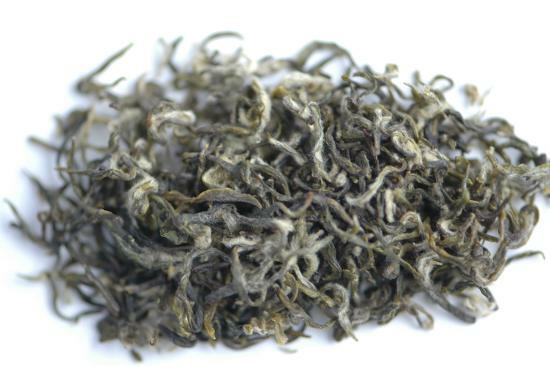 The name is most probably derived from the appearance of the white downy tea leaves that look almost like snowy-white mountain peaks. This tea is relatively expensive and costs over 200 SEK per hecto. Huangshan Maofeng is thus a fine spring tea of high quality and therefore also considered wholesome. During winter the tea bushes get a well needed rest, and during which they gather nutrients from the soil. It is difficult to describe the delicate scent and flavour of this tea. Do I smell something similar to smoked ham or smoked fish? And does it taste like leather? I really cannot say. 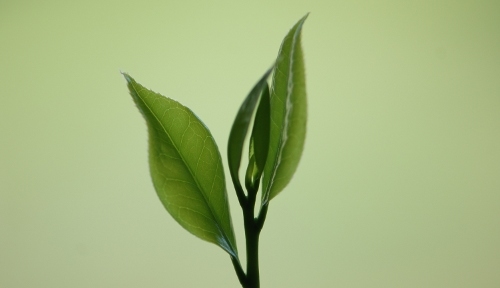 To put it simply, one can conclude that Huangshan Maofeng is a very delicate green tea with an elegant and sweet taste. And the presence of polyphenols is not as obvious as in the exclusive and even more expensive Biluochun. Water temperature: ca 80°C (or 176°F). You can also let the tea leaves remain in the cup as you drink. This is often how they drink tea in China. And also, why not use a lidded cup – a so called gaiwan? This is a green Chinese tea of high quality that was harvested in April/May of 2013. You will however have to open your wallet wide and pay 600 SEK for 100 gram in order to enjoy this exclusive tea. Its Chinese name Biluochun could be translated as ”Green Snail Spring” or ”The Green Snail’s Spring”. Since Biluochun is a delicate spring tea of the highest quality, it is extra rich in theine (caffeine) and other nutrients. And the high content of polyphenols (antioxidants) is supposed to make this type of tea extra nutritious. The presence of the polyphenols is felt as a dry sensation on the tongue and palate. The flavour could be described as grassy and roasted. There will often be a roasted flavour noticeable in most Chinese green teas, since they are roasted in big woks, and are therefore often compared to roasted chestnuts (or perhaps nuts). And provided that a relatively low water temperature is used, there will also be a certain sweetness present in this fine Biluochun. The bitterness will however take over if the temperature is too high. It’s therefore a good idea to use a thermometer when boiling the water. The flavour of Biluochun is quite reminiscent of another famous Chinese green tea called Longjing, but the flavour is more subtle. One can conclude that Longjing is a more price worthy tea when comparing the two. It is also perfectly fine to let the tea leaves remain in the cup when drinking, but then you must not drink too slowly. Biluochun will become quite astringent after just a few minutes. 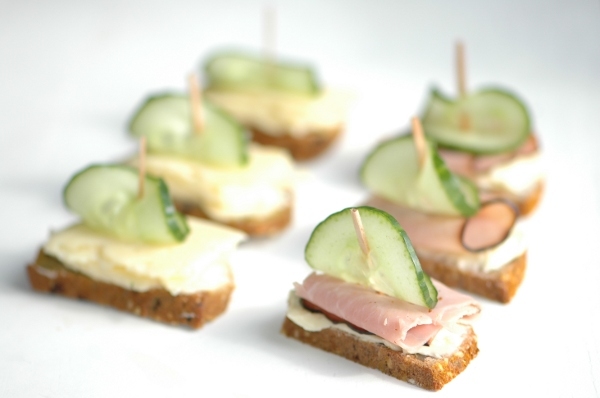 Here is a recipe for those who are looking for a delicious low-carb snack with their afternoon tea. The following recipe will make two baguettes. You can also add walnuts, or curry and dark chocolate to spice them up! You can skip, or replace, some of the “high-carb” ingredients if you want to bake a bread with even less carbohydrates. Baking without baking powder also works just fine! Let the baguettes cool under a towel on an oven grid. (I sometimes put them in the freezer for a few minutes, because I don’t want the bread to lose too much liquid). Slice the bread and butter it. Put smoked ham on the walnut bread (this is a great combination! ), and put some aged cheese on the curry and chocolate bread (this tastes wonderful too!). And then you must of course put the mandatory slice of cucumber on top! This is after all supposed to be a traditional British afternoon tea, but without all the sugary pastry! The ideal beverage to drink in the afternoon is Darjeeling tea (but I must admit that coffee also goes very well with aged cheese). A few examples of such teas are Badamtam, Margaret’s hope, Sungma and Tukvar. 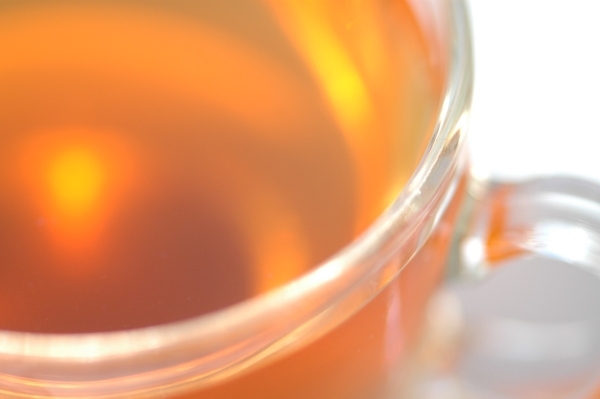 The truth is that every Darjeeling tea that I have ever tasted has been quite delicious! But be aware that only about 10 million kilos are produced every year, and still some 40 million kilos are sold, so there is apparently lots of counterfeit Darjeeling tea on the market. Heat the water to about 95°C (or 203°F) and let steep for about three minutes. And another thing, don’t do like the British who often spoil their tea by adding milk and/or sugar! 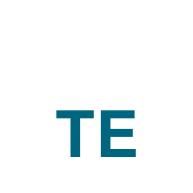 This organic tea farm is situated some eight kilometres north of Duncan city on Vancouver Island (in the southwestern part of Canada). Tea-growing pioneers Victor Vesely and Margit Nelleman told the newspaper Vancouver Sun that there are – at least to their knowledge – no other tea farms in Canada. The first 200 tea plants were put into the ground three years ago, and the couple expects to be able to bring in the first harvest in another two years. And despite some minor setbacks – for example, deer appears to be fond of their tea leaves – they have decided to expand the plantation with even more plants in the near future. Thus far they have only been experimenting with the tea leaves: “We’ve worked with local chefs and done fun things like rolled tea leaves dipped in chocolate.” The couple has furthermore opened a tea room and they also hold tea events. Their ambition is to start selling their local “Cowichan tea” from Cowichan valley within just a few years. Visit their website at: www.teafarm.ca.